Bean sprouts are rich in nutrients like vitamin C, protein, and fiber which keep you full and improve the function of insulin in the body. 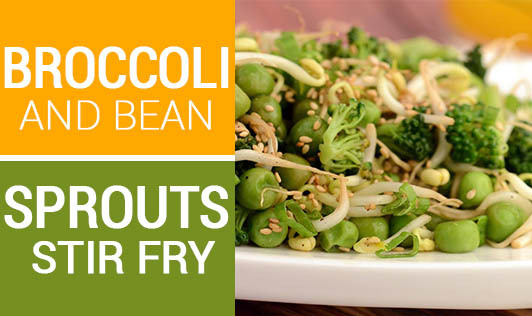 Mix these nutritious sprouts with colorful vegetables to make a low calorie snack that is both tasty and nutritious. • Blanch broccoli and baby corn in boiling water and keep aside. • Heat 1 ½ tsp oil in a wok or a non-stick kadai, on high flame. • Add garlic and sauté for a minute. • Now add the bean sprouts, broccoli, capsicum and baby corn and stir fry on high flame for a few seconds. • Add the thyme, chili flakes, and salt, and cook for 2 minutes. You can also make use chicken/ mushrooms/paneer or tofu in the stir fry.Remember to cook the vegetables on a very high flame to prevent mushrooms from letting out any water.